ZIMBABWE – Cabinet has unanimously endorsed Nigerian billionaire Mr Aliko Dangote’s decision to invest in Zimbabwe’s critical economic sectors, with his high-powered technical team expected in Harare on Monday to conclude the deals. Mr Dangote, who is Africa’s richest man with a net worth of about $21,1 billion according to Forbes Magazine – 2014, was here on Monday to seal investment deals. He is interested in cement manufacturing, coal mining and thermal power station construction. Mr Dangote met President Mugabe and his Vice Presidents Emmerson Mnangagwa and Phelekezela Mphoko. The delegation also met Foreign Affairs Minister Simbarashe Mumbengegwi, Energy and Power Development Minister Samuel Undenge and Tourism and Hospitality Industry Minister Walter Mzembi at their offices. They also met Mines and Mining Development Minister Walter Chidhakwa and Transport and Infrastructural Development Minister Obert Mpofu, who is also the Acting Minister of Industry and Commerce. 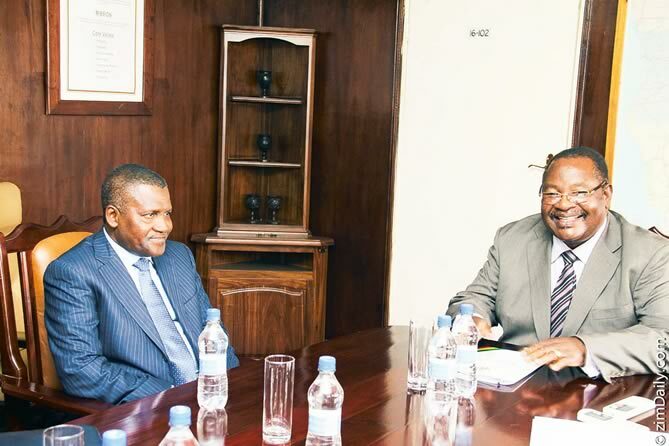 In an interview with The Herald on Tuesday, Minister Mpofu said Government was elated with Mr Dangote’s interest. “Cabinet actually endorsed this initiative overwhelmingly,” said Minister Mpofu. “Everyone said they were impressed and excited about the manner in which he is committed. “Whoever he met, including President Mugabe, he categorically stated his decision to invest. He didn’t need to be convinced by anyone to do that. He had already done a lot of studies about Zimbabwe before he came here.” Minister Mpofu said his ministry was ready to facilitate and expedite all the necessary arrangements to ensure the investment materialises. “This is one investment that has created a lot of anxiety and excitement. The beauty about this is that we have all the ingredients for cement manufacturing. For instance, we have limestone deposits in Kanyemba, in some parts of Midlands and other areas. We also have gypsum that we use in fertiliser. “It will be easy for this investment to be consummated. This process was held very well. “Dangote is a serious investor. I am advised that his officials have already started processing the papers. He is sending a high-powered team of personnel on Monday,” said Minister Mpofu. Minister Undenge said his ministry would do everything within its mandate to make sure Mr Dangote’s investment succeeds. He said his ministry was already in the process of setting up a local team to work with Mr Dangote’s technical team. “He is really interested in participating in the production of electricity in Zimbabwe. They are going to send their technical team next week, which we are going to work with. “He will start with thermal power generation. It’s more exciting to him because we have vast deposits of coal in the country. “This is real investment. As you know, we should drive investment ourselves as Africans. He is a Pan-Africanist and he appreciates that as Africans, we should drive the economic agenda in Africa. We should drive investment in Africa,” said Minister Undenge. Economic Planning and Investment Promotion Minister Simon Khaya Moyo, said his ministry was ready to facilitate Mr Dangote’s investment in Zimbabwe. He said Government was working flat out to remove laws that inhibited investment. “That’s why we insist that the Zimbabwe Investment Authority be transformed into a One-Stop Investment Shop to do away with so many obstacles that make investors feel unwanted. “As a ministry, we shall coordinate with the other ministries and work collectively not individualistically. We must all work towards growing the economy to meet the needs of our people. “When his team of technocrats come next week, we will make sure that our local team is wide awake and move together with them,” said Minister SK Moyo. He said Government wanted all foreign investors who came to Zimbabwe to find it easy to do business. Minister SK Moyo said the fact that President Mugabe met Mr Dangote was testimony of the country’s readiness to embrace him. He added that the onus was now on various ministers to ensure that they fulfilled their mandate as espoused by the President. The minister said the fact that Mr Dangote had investments that ran into hundreds of millions of dollars in the Sadc region was a clear indication of his commitment to see the continent prosper. Zimbabwe has become a favourable investment destination for many and recently Government also sealed some mega deals with Chinese and Russian investors.